Ok so it has been typical half term weather, very hit and miss, rainy one minutes and sunny the next. This means we've had a mixed bag of activities going on. Baking, crafting and dvd days mixed in with days out to Chessington and exploring the woods. As you will see by this weeks project 365 photos, we have been rather busy, meaning this week seems to have flown by. Sunday started off as a lazy day, just chilling on the sofa in our pjs before all the baking fun started making ice cream cone cupcakes. 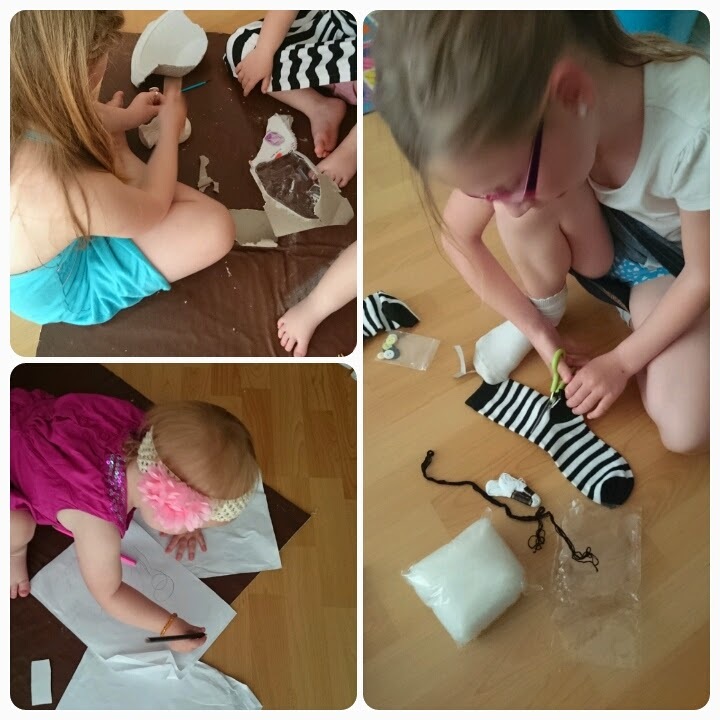 Monday was one of those miserable rainy days so the girls and I busied ourselves with lots of craft activities. Aaaaa funny five minutes going on here, Elise and I couldn't help chuckling at the others wiggling their bottoms in the air. 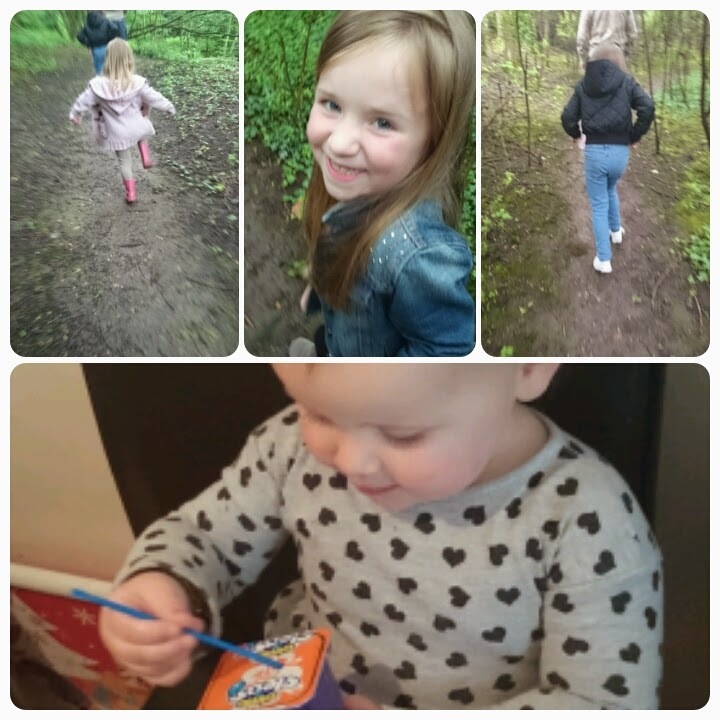 Time for exploring the woods, lots of mud to sink into, we were left regretting not wearing wellies!!! And of course refreshment was needed after. 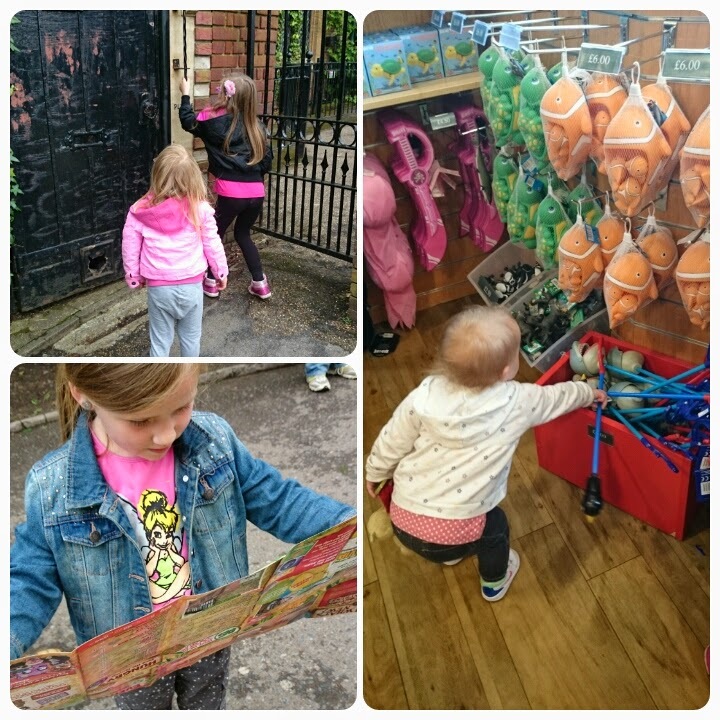 We were lucky enough to be offered tickets to got to Chessington World of Adventures, Daddy Hazelden and Layla were unwell but we managed to make the best out of a bad day with Freya as our guide. Dinner out with the family. 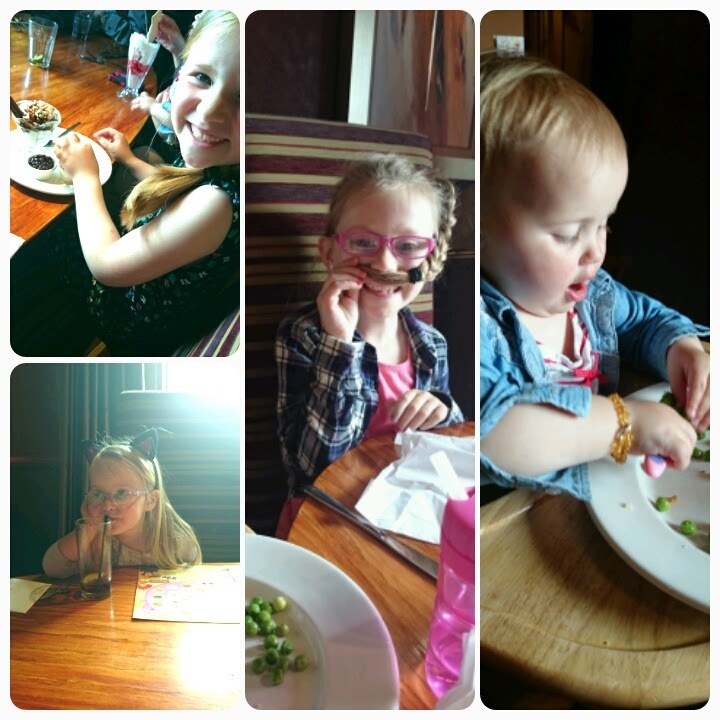 Layla was concentrating hard to get those pesky peas on her fork, Elise finished eating before everyone else so was busy creting her very own moustache?? Gracie was enjoying her coke and Freya chose the sundae with the most sweets and didn't even share with mummy!!! 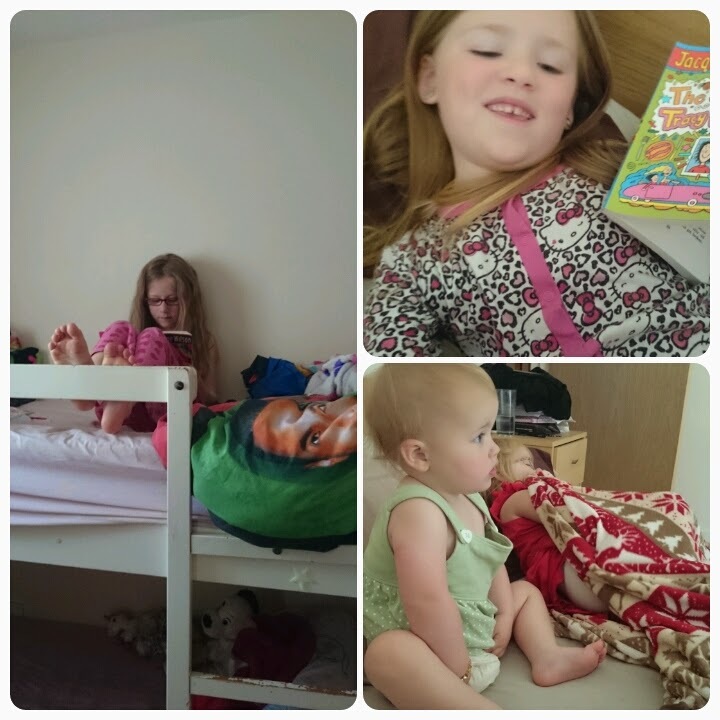 Elise woke up early but chose to stay in her own bed reading, whilst the other three monkeys chose to invade my bed, no room left for me!!! WOW Layla has an awesome pencil grip in that pic and a wonderful hairband. Looks a bit like our week too with pj days and craft activities. Sounds like our week too - a definite mixed bag this half-term. Love the photo of the girls in bed at the end. the bottoms in the air are funny no wonder you were laughing. 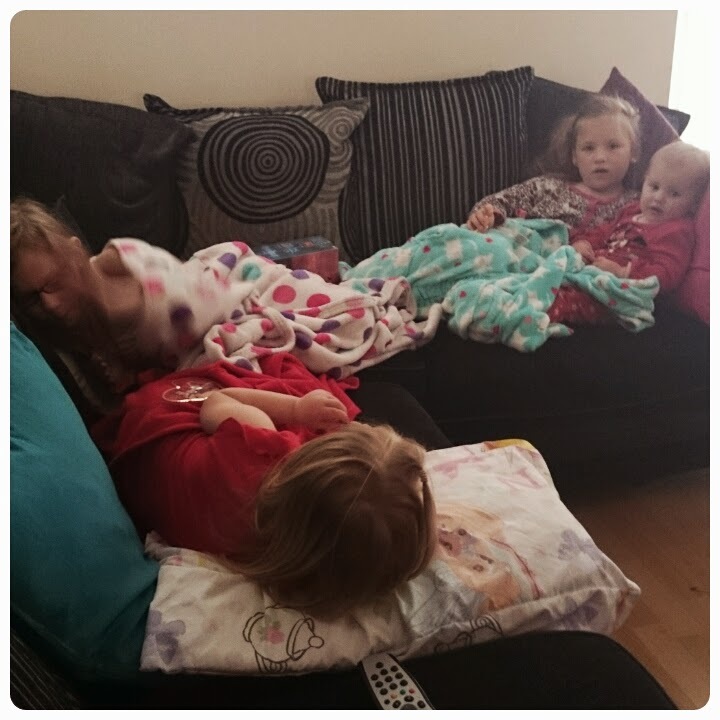 A day lazing on the couch is needed every now and then, but my lot would have been hitting and squabbling so close together. Shame they were not all feeling up to scratch for the day out. My oh refuses to eat peas cos they wont stay on the fork, I am forbidden to put them on his plate if they are loose. What a busy week. Love the bottom wiggling! Looks like a fun walk in the woods. Pesky peas! 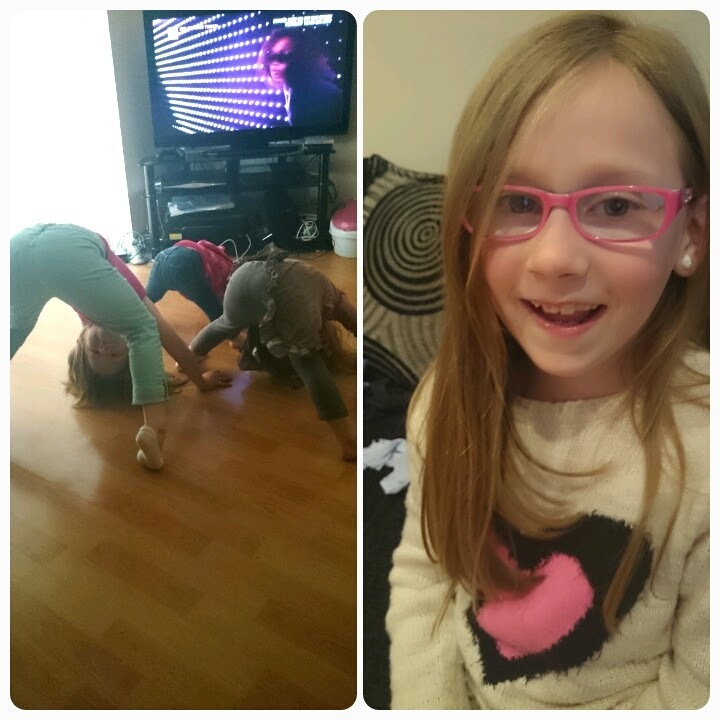 Love the bottom wiggling, the girls always seem to be having fun. I think we've all been out and wished we had put our wellies on..often come home with splashed shoes and clothing.